Rare opportunity to own the gem of Jamul! A farmhouse lover's dream, this one-of-a-kind, spacious home was originally built in 1890 then expanded in 1956. Some of the original hardwood floors still exist and are beautifully balanced w/today's updates esp. in the kitchen & newly remodeled master bath. This historic home is perched on 1.65 acres w/breathtaking views to the east. A 1,600 sf barn in back boasts a 2-car garage + workshop w/the upstairs framed out for a perfect 800 sq ft detached guest house!, Family fun awaits all over this gorgeous, peaceful property... the spacious, covered patio off the family room leads to a cozy fire circle and overlooks a large horseshoe pit with breathtaking mountain views in the eastern background. The Weatherbest-decked, front porch with high-end redwood railing welcomes you in and takes you back in time as you enter this alluring home with high ceilings and special wood finishes throughout. A potential candidate for the Mills Act property tax discount for historic homes, it is an incredible catch for a historic home or farmhouse seeker. There is lots of land for you to get creative... even zoned J... horses allowed! You won't find anything else like it nearby with its quaint bedrooms and kid's reading nook upstairs and spacious layout with character-rich craftsmanship downstairs. 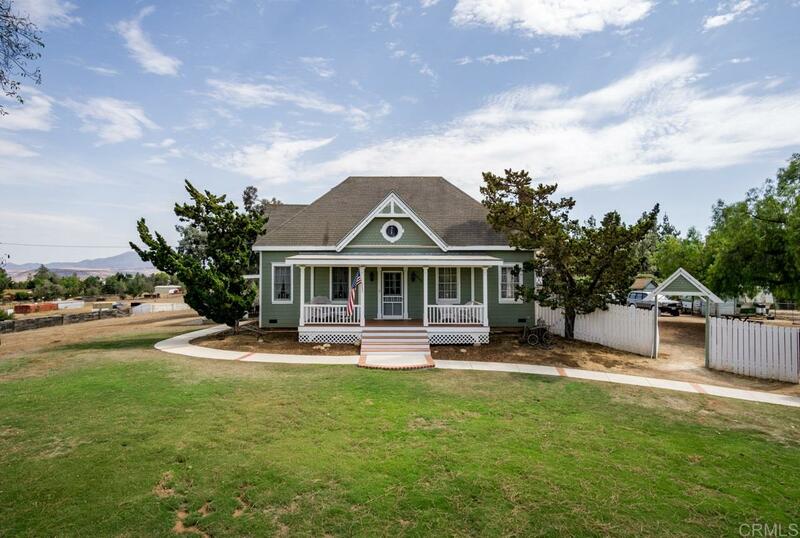 Country living at its best yet so near the heart of downtown Jamul and approximately five miles away from Rancho San Diego's shopping centers.